Posted by Nupur. We interrupt our holiday break to bring you this finished project! It has only been a couple of years since I started quilting and most of what I've done have been easy baby and kid quilts. 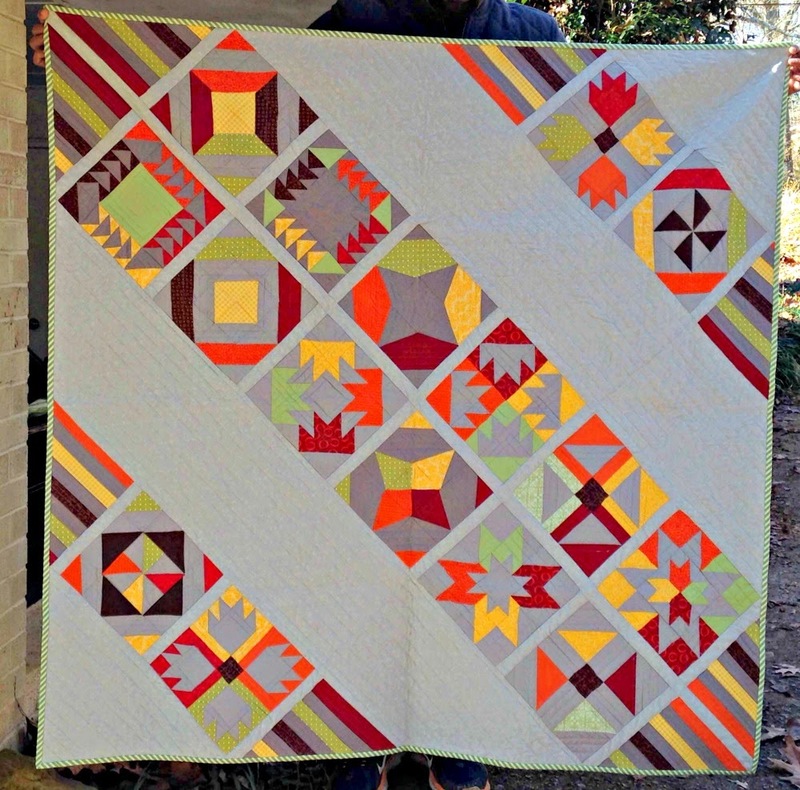 Around last Thanksgiving, Anne Marie of GenX Quilters announced a Block of the Month pattern for 2014 called Vice Versa. It looked beautiful and doable to me in a skill-building sort of way. This pattern has you making a pair of blocks each month- you make one block, then invert the positive and negative spaces to make the pair of that block. What's more, at the end of the year, the blocks are set in a fresh and modern way, on point. The colors I chose were inspired by my masala dabba or spice box- the colors of fiery cayenne pepper, turmeric, garam masala and sweet-smelling cardamom pods. 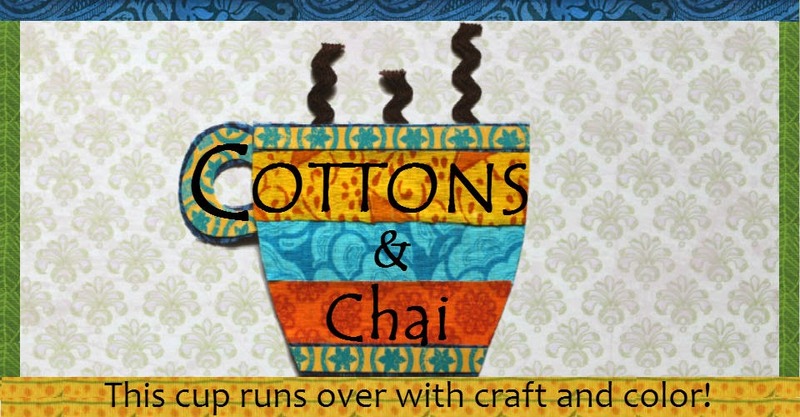 Cooking is my first love and I enjoyed bringing it into my quilting this way. So this is my Spice Box vice versa quilt. This was my first "real quilt". Anne Marie's pattern was outstanding. She explained everything in great detail. The pattern was very challenging for my skill level, though! There's was lots of overuse of the seam ripper, cursing, misaligned seams but I powered through and got the quilt finished. Given where I started, this finish is nothing short of a miracle. This quilt will go into my guild's quilt show this Spring in the novice category. 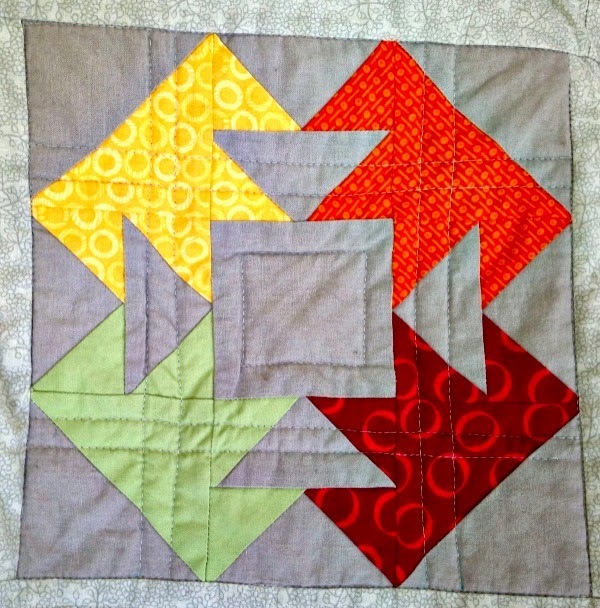 This picture probably shows some of the quilting better. I machine quilted it on my el cheapo Brother sewing machine, over Thanksgiving week. The quilting took maybe 15 hours. 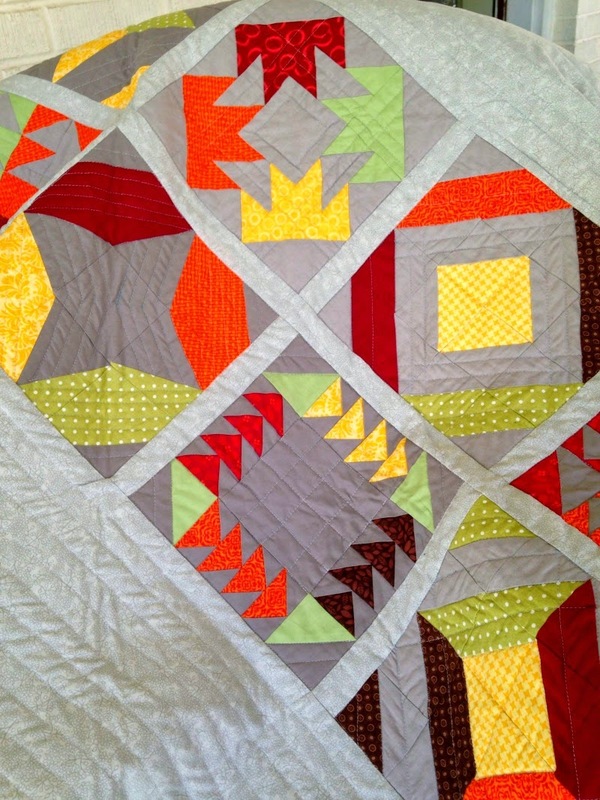 Lots of straight lines- on the diagonal and each block was quilted with some pattern of straight lines too. Thanks Anne Marie for a terrific BOM experience and for helping me really and truly fall in love with quilting. Go look at more Vice Versa quilt finishes here. It turned out beautiful! I agree, Anne Marie did a great job with each and every block tutorial! Thanks so much! I learned SO much with every block, and then with assembly and quilting. Many firsts for me here. Love your colors! 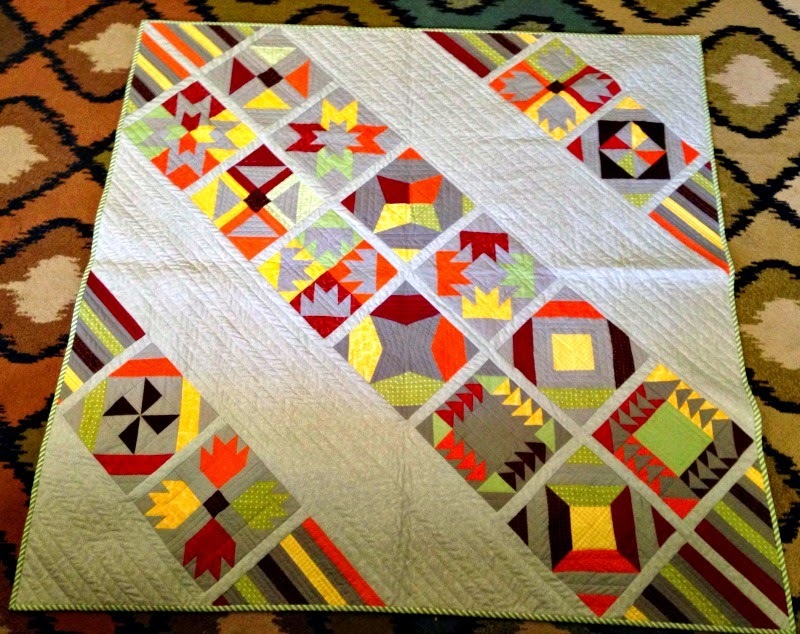 Well done on the quilting too - its a lot of work but your VV quilt is stunning! I'm in love with my new Babylock Melody :) It really is a great little machine although it will take me time to learn all the features. I found a sale (of course) and couldn't resist (of course). This is so pretty! A winner for sure. 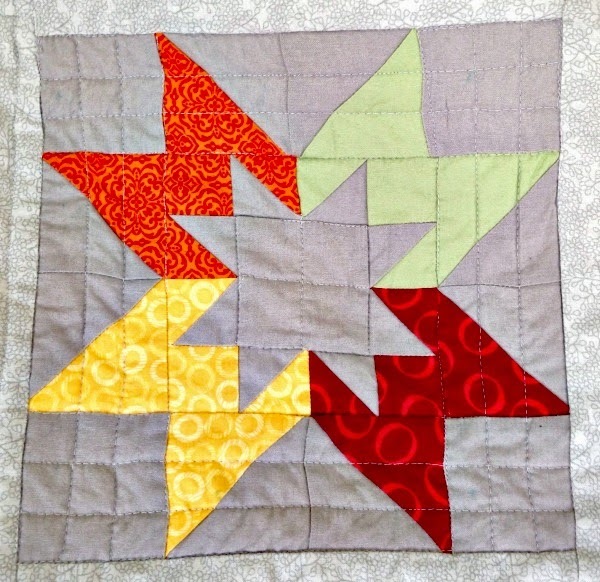 What a gorgeous quilt Nupur! I am in love with the pattern and colors. Congrats on your new sewing machine, I can't wait to see what you make next.